Sarah began her ballet training at the age of 6 in her hometown of Sacramento, California with Pamela Hayes. She continued her dance studies at Butler University where she had the opportunity to perform principal and soloist roles including the Sugar Plum Fairy in The Nutcracker, Fairy Miettes Qui Tombent in The Sleeping Beauty; and also in George Balanchine’s Valse Fantaisie. While at Butler, she toured Eastern Europe with Butler Chamber Dance and took classes as well as performed with the National Schools of Ballet in Poland, Slovakia, and the Czech Republic. Sarah graduated from Butler University in May of 2016 with a Bachelor of Fine Arts in Dance Performance and a minor in business. 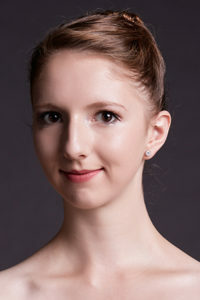 Sarah joined Eugene ballet as an aspirant in 2016 and has had the opportunity to perform a soloist role in Val Caniparoli’s Tutto Eccetto Il Lavandino, as well as the Chinese soloist and a Harlequinade in The Nutcracker. This is Sarah’s first season as a company member with Eugene Ballet.